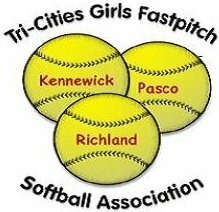 Tri-Cities Girls Fastpitch Softball Association (TCGFSA) is an organization providing opportunities for young ladies ages 6 - 18 to play recreational and competitive Fastpitch Softball in the greater Tri-City area of Washington. League board meetings are typically held as needed on the first and third Monday of each month. Check the calendar on the homepage for time and place. Coaches, parents, and adult volunteers are encouraged to attend. Please contact President for more information.